Mirick O’Connell has never wavered from the core principles of professional excellence established by our founders. Our attorneys combine uncompromising standards of service with practical and cost-effective approaches to problem solving. Mirick O’Connell has the expertise to handle the most sophisticated and complex matters, while never losing sight of our first priority- the client. Mirick O’Connell has a long, proud tradition of service to our region. Our attorneys and professionals have enthusiastically embraced opportunities to couple good citizenship with excellent lawyering. We also appreciate that opportunities that rise simply as a result of our status as a leading law firm in the region, and we are therefore committed to continued service aimed at bettering the lives of those who live and work in Central Massachusetts and beyond. Mirick O'Connell counts it a privilege to be entrusted with a client's legal matters. The paramount importance we place on our client relationships is aptly set forth below. Mirick O'Connell celebrates 100 Years of Excellence! Thank you to our clients, referral sources, attorneys and professional staff for your trust and loyalty throughout the years. Mirick O'Connell has a long, proud tradition of service to our region. Since our founding in 1916, our attorneys, paralegals and administrative staff have enthusiastically embraced opportunities to couple good citizenship with excellent lawyering. We recognize that our lives are deeply enriched when we volunteer. We also appreciate the opportunities that arise simply as a result of our status as a leading law firm in the region, and we are therefore committed to continued service aimed at bettering the lives of those who live and work in Central Massachusetts and beyond. Continuing a strong tradition of supporting local charitable endeavors and cultural centers, our attorneys currently serve as trustees and directors at UMass Memorial Medical Center, the United Way of Central Massachusetts, the Worcester Historical Museum, Higgins Armory, the Boys & Girls Club of MetroWest, and local YMCAs, to name a few. With a strong commitment to the dedicated organizations that support our clients' businesses, our attorneys serve on the boards of directors or subcommittees of many of the local and regional chambers of commerce. The Worcester Chamber of Commerce is currently chaired by one of our partners, and other attorneys from the firm serve on the boards for the MetroWest, Milford Area, Marlborough Regional, and Corridor Nine Area chambers. Our attorneys are also active in leadership within the WPI Venture Forum, the Center for Women & Enterprise, Clark University Small Business Development Center, the InnerCity Entrepreneurs program and other business groups that provide training and assistance to established and emerging enterprises. Appointed by their colleagues in the Bar and by local leaders, our attorneys have held prestigious positions such as commissioner of the Commonwealth of Massachusetts' Judicial Nominating Commission, president of the Massachusetts and Worcester County Bar Associations, chair of the Board of Bar Overseers, chair of the Worcester Economic Club and chair of the boards of directors for multiple chambers of commerce. Deeply concerned with the pressing issues facing our local communities, our attorneys can be seen throughout the region volunteering on their town's zoning, planning, finance and conservation boards, school committees, churches and synagogues. In addition, they can often be found on the weekends and after hours on the local soccer and Little League fields as coaches and mentors. We value the many relationships, personal and professional, that are developed through volunteering. Accordingly, we invite charitable, civic and business-oriented organizations to contact us if you are looking for dedicated volunteers to better the lives of those within our region. Mirick O’Connell has been growing and evolving for over 100 years. An enduring strength of our firm is a collegial and respectful work environment where individuals with a variety of backgrounds, perspectives, and life experiences come together to provide outstanding legal services. Guided by our Diversity and Inclusion Committee, Mirick O’Connell strives to support diversity within our firm, as well as to reflect the communities, organizations, and clients we serve. We are committed to promoting an inclusive atmosphere, and to recruiting and retaining talented, creative, and diverse individuals. 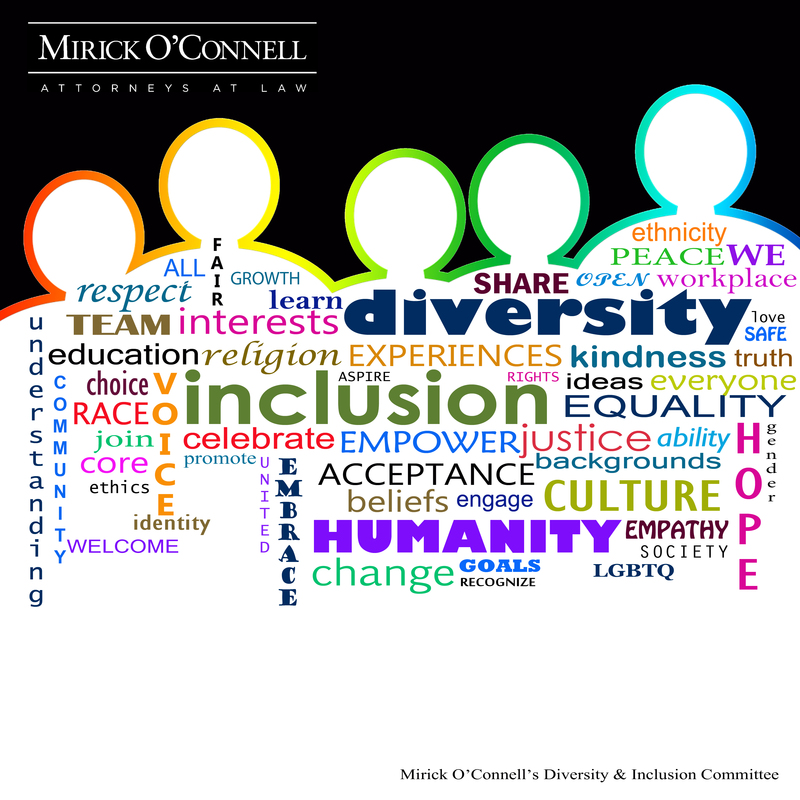 These firm-wide diversity and inclusion efforts will enable Mirick O’Connell to better understand and serve our clients, and continue to flourish as a dynamic organization. Mirick, O'Connell, DeMallie & Lougee, LLP has a rich history as a Central Massachusetts-based law firm with an uncompromising commitment to excellence in client service and to the communities in which our attorneys and staff work and live. The firm was founded in 1916 by George Hammond Mirick. George's professional career included service as president of the Worcester County Bar Association and as a life trustee of Clark University. In 1930, George was joined in the practice by Paul Revere O'Connell. Setting the standard for the firm's commitment to our communities, Paul's professional career included service as the assistant city solicitor for the City of Worcester, as the director for many local businesses, as a trustee for two banks, and as a fellow of the American College of Probate Counsel. Gardener Graves DeMallie-our third named partner-joined the firm in 1936. His legal career was interrupted by lengthy service to our nation during World War II as an officer in the U.S. Navy. Following the end of the war, he rejoined the firm and went on to serve as a member of the Worcester City Council, as the director of many local businesses and charitable organizations in the region, and as a fellow of the American College of Probate Counsel. Laurence Hodgdon Lougee began practicing law in 1935. His legal career was also interrupted by service as an officer in the U.S. Navy during World War II. During his naval service, Laurence fought in both the European and Pacific theaters. Following completion of his honorable service, he joined the firm and later served as vice president of the Worcester County Bar Association, as president of the Massachusetts Bar Association, as a member of the American Bar Association's House of Delegates, and as a founding trustee of the Massachusetts Continuing Legal Education Foundation. Laurence also devoted countless hours to volunteer service as the director of many local businesses and charitable organizations. While the firm has been privileged to see successive Mirick, O'Connell, DeMallie, and Lougee generations join the practice, it has evolved from family-centered practice to one of the leading business-focused law firms in the region, with attorneys staffing offices in Worcester, Westborough and Boston. With this growth has come the expansion of practice areas that address the complex legal needs for businesses ranging in size from small start-up companies to large, multi-national, publicly traded companies. The firm also has a trusts and estates practice and a personal injury practice that serves individual clients. One thing has remained unchanged throughout our nearly 100-year history: we have remained true to our unwavering commitment to excellence in client service and results-driven representation. We continue to stress the importance of two bedrock principles: (1) our clients must not only receive excellent representation, but such excellence must be delivered in a cost-efficient manner so that we set ourselves apart from our competitors in terms of both results and value; and (2) we must never lose sight of the importance of active commitment to our region through volunteer service. As members of GGI, one of the top ten international accounting, consulting and law firm alliances, we are able to deliver the best possible advice on a global scale. Through GGI we have access to experts around the world who are able to give advice on local regulations, compliance and go-to-market strategies. GGI’s broad international presence opens up a gateway to the global marketplace for both us and our clients. Through our GGI membership we have access to high quality firms in nearly every major financial and commercial centre worldwide. This remarkable facility applies whether you are looking for business opportunities beyond national boundaries, or need international support in addition to services in your home market. We are here to help and support your success wherever your business takes you. We value the relationships we have developed over the past 100 years, and we look forward to enhancing existing relationships and developing new ones. Our Management Committee is committed to overseeing professional excellence, providing top-notch client service, maintaining cost-effective legal services and continually enhancing our community commitment. We believe in internal collaboration and collegiality. We work as a team to manage all internal operations. We look forward to serving you today, tomorrow and into the future. Our Management Committee shows pride during the Firm's 100th anniversary employee BBQ outing.